Progressive Charlestown: How bad can it get on the border? As Common Dreams reported, President Trump announced Sunday that Nielsen would be leaving her position. During her time as Homeland Security secretary, she oversaw widely condemned policies including the forcible separation of families and the caging of children at the southern border. Commenting on her tenure, the ACLU tweeted Sunday: "From the family separation crisis she created and defended, to restricting immigrants' rights to seek asylum, to relentless and pointless efforts to build Trump's border wall, Nielsen's department served as the key to Trump's unconstitutional and anti-immigrant agenda of fear." With such a record, progressive lawmakers like Rep. Pramila Jayapal (D-Wash.) welcomed her departure. "Nielsen will go down in history as presiding over an exceptionally cruel regime that separated families and violated human rights," Jayapal said. "I welcome her resignation and believe she should be held accountable for the abuses that happened under her watch." At the same time, reports that the Trump team is reportedly eyeing a successor with an even more hard-line approach to immigration triggered alarm. "When even the most radical voices in the administration aren't radical enough for President Trump," said Sen. Minority Leader Chuck Schumer, "you know he's completely lost touch with the American people." EDITOR’S NOTE: In my view, Trump’s obsession with the border and hatred for immigrants takes us on an inevitable course to Border Patrol or US troops opening fire on immigrants, either en masse or individually. They might even receive orders from Trump to do so. After all, he is already telling them to violate court orders to block immigrants from seeking asylum and to take children from their parents. Is it such a leap that he would order immigrants to be shot down? Who would stop him? Certainly not Stephen Miller. 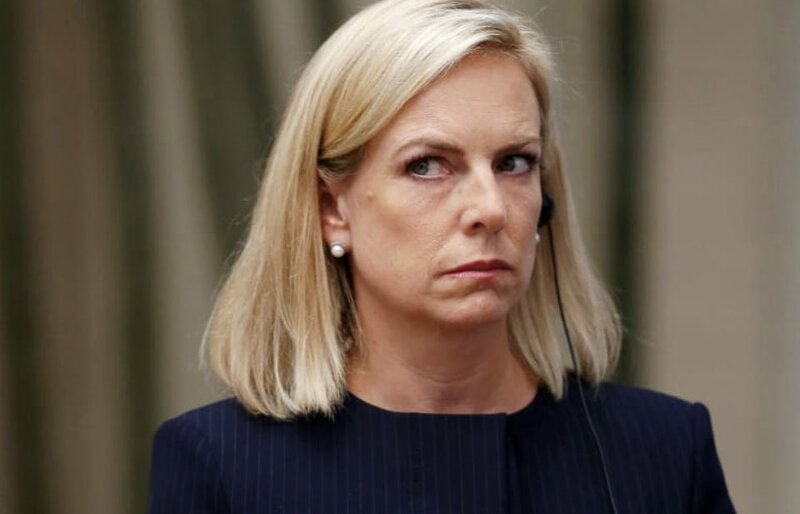 It's no secret that Mr. Trump had a problem with Ms. Nielsen, whom he considered "weak" on matters of border security. The president and Stephen Miller, his hard-line immigration adviser, have long grumbled privately about the secretary's insufficiently brutal approach to the surge in migrant families across the border. Last May, stories surfaced about Mr. Trump publicly berating her in front of the entire cabinet for failing to stop the crossings. A source familiar with Nielsen's thinking told CNN Nielsen is taking this as a relief. Nielsen "believed the situation was becoming untenable" with Trump "becoming increasingly unhinged about the border crisis and making unreasonable and even impossible requests," a senior administration official told CNN on Sunday. The president called Ms. Nielsen at home early in the mornings to demand that she take action to stop migrants from entering the country, including doing things that were clearly illegal, such as blocking all migrants from seeking asylum. She repeatedly noted the limitations imposed on her department by federal laws, court settlements, and international obligations. A likely force behind such impossible requests was Miller. In a separate story, CNNreported that Miller "played key a role in Nielsen's ouster," and his "heightened influence within the West Wing has been aided by the president, who recently told aides in an Oval Office meeting that Miller was in charge of all immigration and border related issues in the White House, according to a person familiar with the meeting." [I]t is something of a national crisis that even as loyal an apparatchik as Nielsen wasn't cruel enough to suit this administration*, which, in a tragic misallocation of resources, cages children and not Stephen Miller. But this is the administration* she had chosen, and nothing more becomes her public service than her leaving of it. The worst is yet to come. Nielsen may be just one of the people Miller has targeted for ousting. According to Politico, the White House adviser has been "telephoning mid-level officials at several federal departments and agencies to angrily demand that they do more to stem the flow of immigrants into the country, according to two people familiar with the calls," the outlet reported. Miller was also behind withdrawal of the nomination of acting U.S. Immigration and Customs Enforcement Director Ronald Vitiello to lead ICE—a move taken so that the White House could take the agency in a "tougher direction," Politico reported. As for Nielsen's job, Trump announced that Customs and Border Protection Commissioner Kevin McAleenan would serve as acting DHS secretary. With one senior DHS official saying McAleenan is "not an ideologue or fire breather" on immigration and Miller now formally holding the reigns on the matter, however, it's unclear how long he'll stay in the role.